The vocalist famous for wowing Chicago sports teams’ audiences with his rendition of the national anthem impressed graduates with his story of perseverance. 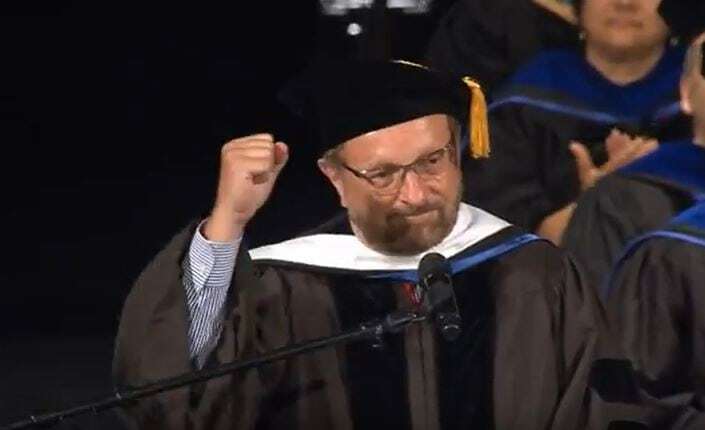 At times quoting Eleanor Roosevelt, Winston Churchill or John Lennon, Dr. Wayne Messmer offered words of encouragement and inspiration as he delivered a rousing speech to the Chicago and Online campus graduates of The Chicago School of Professional Psychology (TCSPP). The man known for his golden voice and for overcoming great personal tragedy shared truth and wisdom with the nearly 500 graduates and their loved ones on July 6 at the historic Auditorium Theatre. A professional vocalist who has sung the national anthem for the Chicago Cubs, White Sox and Blackhawks, and is also an announcer, Dr. Messmer survived a gunshot to his neck in 1994 and returned to his career as a vocalist. He is also a radio broadcaster, professional speaker, author, actor and co-founder of a financial services firm. He received his Ph.D. from LaSalle University. The Chicago School awarded Dr. Messmer with a Doctor of Humanities, honoris causa degree. One of the leading nonprofit institutions devoted to psychology, and related behavioral sciences, The Chicago School offers more than 20 programs on campuses in Chicago, Southern California, Washington, D.C., Dallas and online.